When The Fellowship of the Ring came out in 2001, everyone knew it would be made into an inevitable game with bad gameplay. That didn?t happen. In fact, no game came out until 2002, when The Two Towers was released on all major consoles, just before the movie came out in theatres everywhere. The Two Towers boasted the actors from the films, movie footage, the music from the films, and multiple levels ranging from the first battle against Sauron in the First Age, when the One Ring could have been destroyed, to the defense of Helm?s Deep, where, as you probably know, the player comes out victorious, true to the movie?s story. The Two Towers was also extremely well done, with sufficient challenge and unlockable DVD-style extras to keep the addicted coming back for more. Plus, it didn?t play half bad. Different games have been released based on this particular Tolkien franchise. (J.R.R. Tolkien wrote The Lord of the Rings for those who don?t know.) The most recent of these, which was not released by EA, was a game from Black Label Games, a Vivendi Universal development studio. They started a series of games with the books in mind, starting with The Fellowship of the Ring, and continuing with the now cancelled The Treason at Isengard, which is what VU Games intended to call the game based on The Two Towers and The Return of the King. 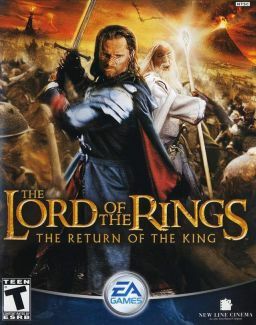 These games were not well received, especially the buggy GBA version of The Fellowship of the Ring, which was so buggy that you had to press a certain button in a certain room at a certain time, or your save file would be lost. Not too good. One other game has been released by VU Games, based on the novels of Tolkien. That is the RTS[Real-time-strategy] game The War of the Ring, which is, in fact, what Tolkien intended to call the final book of his universally famous trilogy. While most still do not know the quality in The War of the Ring, which was developed by Liquid Entertainment, makers of the critically acclaimed Battle Realms for the PC, you can still stick with a sure bet: The Return of the King, out now on a game system near you, and coming out on December 16 in a theatre near you. Graphics: One Ring to rule them all? From the minute you start up The Return of the King, you will realize that there is something special with this game. It all starts with Helm?s Deep, chronicling the battle that the armies of Rohan fight against the uruk-hai orcs of Isengard, Saruman?s domain. But at the moment when Gandalf and the Riders of Rohan charge down the hill to the victory of Rohan, and the game seamlessly switches from full motion video to CGI graphics, that is a perfect example of this game?s forte as an amazing graphical achievement. Every environment is captured realistically and features sets from the films. If you play through the Helm?s Deep level, for example, you will most likely recognize many features from film The Two Towers. Even Isengard, Saruman?s realm, looks, and feels like the battle with the giant trees called Ents from The Two Towers. Perhaps the best feature about the environments is that a good portion is interactive. Basically, this entails destructable objects, but it means so much more. Now, you can fire catapults and ballistas, destroy towers, climb ladders, throw spears, knock over pots of boiling oil. The list goes on and on with what you can do. Animation is also quite well done, from the hordes of orcs on screen moving without a glitch to the heroes that you fight as, and those that fight beside you, moving valiently against the evil enemies. Bosses, such as The Witch King, are perhaps the most well animated. The boss mentioned above happens to be one of the nine kings that were seduced by the Ring of Power. Other well done effects are the hundreds of thousands of orcs rushing at you in the background on some levels, to Mount Doom sitting amidst a red-orange sky that is belching white lightning. All of these effects add up to one of the best movie-to-game experiences that money can buy. Game play: ? ?the fate of Middle-earth now rests in the hands of a Hobbit and a King?? Game play is divided into three unique paths: the Path of the Wizard, the Path of the King, and the Path of the Hobbit. Gandalf is the only playable character in this path, and he starts out when you boot the game up. The level is Helm?s Deep, but I don?t think I need to say any more about that particular level. It really is just a tuitorial. His levels range from the above mentioned level to the defense of Gondor?s Minas Tirith. Gandalf even helps the Ents at Isengard, and goes to the Black Gate with Aragorn, Legolas, and Gimli. His style is pretty unique to his person, mainly because of his combined usage of his staff and sword. Gandalf is slower than the warriors, but faster than the Hobbits, and he never punches, kicks, or shoulder rams. Typically, Gandalf?s fighting style is much more refined than other choices included in The Return of the King. All three of the original characters from the first game, Aragorn, Legolas, and Gimli, are featured in this path as playable characters. They follow perhaps the darkest and most atmospheric route through the game, from the first level, the Paths of the Dead, to the last level, the Black Gate. The Paths of the Dead is basically a haunted mountain that has the spirits of hundreds of ancients in it. These spirits are malevolent and bring piles of bones back to life. Basically, Aragorn?s ancestor Ilsidur cursed a king to this mountain, and all of his followers had to go with him. They are not, in actuality, evil, but the dead of this mountain put up quite a fight. The second level on this path is the darkest. It is called the King of the Dead, and it features a frenzied battle with the dead king, after which follows a flight from the mountain in a desperate attempt to get out alive. These guys can put up a mighty good fight. While their swords may not be the most powerful, they have stealth on their side. Each path?s characters feature a special ability unique to each group of characters: Gandalf?s ability is basically a damaging force field that will kill all enemies it touches. The warriors(Aragorn, Legolas, and Gimli) all have a skill multiplier that makes Perfect mode come up faster and racks up the experience points. The hobbits, on the other hand, have their cloaks. While this may seem like much, what exactly did the cloaks do? Do you remember? Probably not. They cloak the hobbits, and the hobbits can stab enemies in the back. This provides a major advantage to the hobbits, and allows them to get by baddies and not have a serious problem. Besides these three paths, the game play mainly consists of standard hack-n-slash fare, complete with kicks, punches, and swords. Projectiles and explosives again come into the game, but certainly not as much as with last year?s edition. Inventive ways to kill enemies, interactive environments, and some truly awesome swordplay all round out some great game play. Once again, EA has outdone itself with excellent voice acting and great sound effects and music. The music is, once again, taken directly from the movie?s score, while the movie?s actors provide new dialogue and sounds. Ian McKellan, who plays Gandalf, provides the most new recordings, mostly because he is the narrator of the game, as well as a key player. Strong voice acting, with rousing music, and great battle sounds make this the game for any videogaming audio enthusiast. Control: ?YOU SHALL NOT PASS!? Some of the most intuitive controls, outside of Tony Hawk?s Pro Skater, are included in this game. Maybe it?s because it?s just a simple action game. Whatever. Mostly, I think that it is because this is the game that is meant for real pick up and play. Appropriateness: ?And in Darkness to Bind Them. Parental Warning: This game is violent, and has its fair share of blood shed. Again, this is one of the cases where the ESRB did not include a content descriptor that should have been there. Black blood sprays from enemies when you hit them, and pours from spiders in certain levels. If you do not like your kid playing shooters, do not let them play this game. It is about as violent as a standard shooter. The Return of the King is also a fairly dark game. Above, I mentioned how the King of the Dead is a level. It involves dead spirits inhabiting the bones of the dead. While this is true to the book, and J.R.R. Tolkien was a Christian and belonged to a Christian writers? group with C.S. Lewis, there is no denying that this is a fairly dark part of the book, and hence the movie and game featuring this. Another dark part is at the Black Gate, when you battle the Nazgul. One of the Nazgul say, ?We shall steal your soul!? This is not cool. Tolkien did feature these evil, for lack of a better word, demons as having the ability to steal your soul, and they can in the story. Still, if you, or any of your family should have any qualms about this sort of thing, then don?t play this game. Remember, however, that the novels have Christian themes in them, and that, essentially, Sauron is Satan, and the Nazgul are demons. This game, if you take a week to play it, will be over by that time. It is short. However, the unlockable content, the replayability, and the inclusion of two player co-op is worth a purchase. I urge you to weigh the pros and cons of this game. Don?t spend fifty bucks if you?re just going to sell it. If that?s the case, a rental might be a wiser choice.